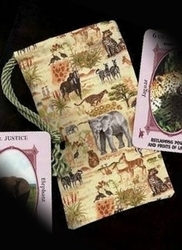 Regular Tarot Bags - Wildlife Regular Tarot Bag - Tarot Bags, Tarot Cards, Cloths, & More! The endangered animals and birds on this fabric include the Grey Wolf, Grizzly Bear, Key Deer, Eastern Cougar, Wood Bison, Woodland Caribou, Brown Pelican, Bald Eagle, Peregrine Falcon, Northern Spotted Owl, Gray Bat, Everglade Snail Kite, California Condor, Piping Plover, Roseate Tern, San Joaquin Kit Fox, Black Footed Ferret, and Whooping Crane. Important Note: Because this is a large scale print (see fabric in the picture), only about a third of the species will fit on one tarot bag at a time. No one bag has all of the animals on it. If there is one animal or bird that you really want, please write its name in the "Comments" box during checkout or send an email us asking about it. 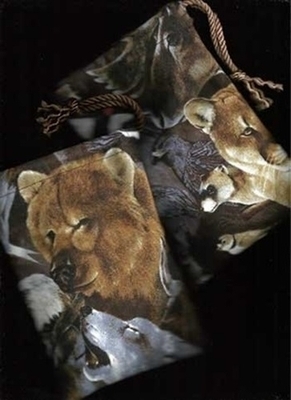 We will do our best to select a bag that shows that animal. Otherwise, your bag could have any combination of approximately six wildlife creatures. 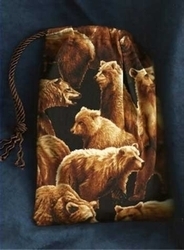 The placement of the animals turns out differently on each bag. Mostly you see heads. Some birds are fully shown. 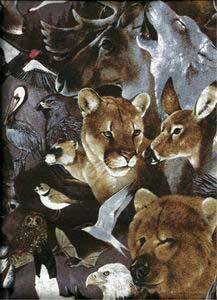 Wild Animals Symbolism: Individually these animals mean different things, from strength (bear) to intellect (wolf) to freedom (eagle). As a whole this collection represents the wild side that each of us hides deep inside. As animals ourselves, it is healthy to unleash our primal nature every once in a while. Size: Regular bags measure approximately 4� to 5 inches wide by 7� to 8 inches tall. 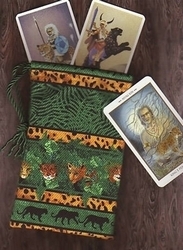 Fits most standard size tarot and oracle decks that measure 3" by 5" or less. 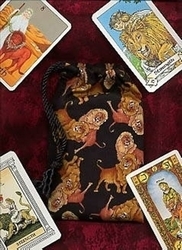 All of our Tarot bags are individually handcrafted with care to ensure quality. Please allow for slight, natural variations in size of the bag or pattern placement.